A drywell is a storage chamber into which excess storm water flows through a drainpipe, and then is allowed to seep down into the surrounding soil. With a professionally constructed drywell your plants and flowers are allowed a better alternative to swimming in a drowning lake of stagnant water. Though many newer homes are already built with a proper drainage system, keeping water from seeping into the basement of a home, a lot of older homes are not built with these as a pre-existing feature. A foundation drain will run around the foundation of the home to a drainpipe that slopes down, away from the house, carrying water to a location where it can be allowed to drain naturally into the surrounding soil. Wouldn’t it be better to let the water into your yard to nourish your landscape than let it into your basement to nourish mold? Not only do you have to worry about water collecting from your own home, you also have to worry about the water flooding towards your house from your neighbors. Standing water is not only hazardous to your landscape, but it can also damage the integrity of your home’s foundation. A French Drain (or trench drain), is a man-made grated trench that carries the water down a slope that we create so that it can saturate harmlessly into the soil, as far from your home as possible. 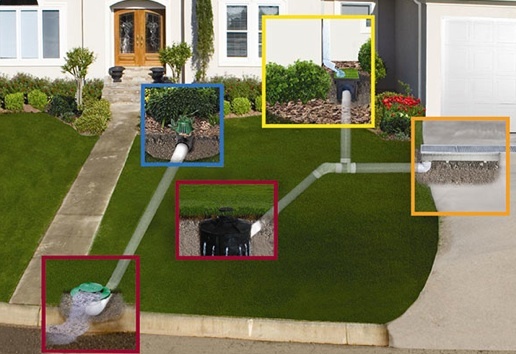 With the proper drainage system, you cannot only protect your landscape, but the foundation of your home as well. With the melting snow and the spring showers on their way, it is best to be prepared before the situation gets out of control. You want to go swimming in a pool, not in your garden bed or in your basement. For more information, call our professional team at Finishing Touch Landscape Construction by contacting us online, or calling (973)-492-0016.